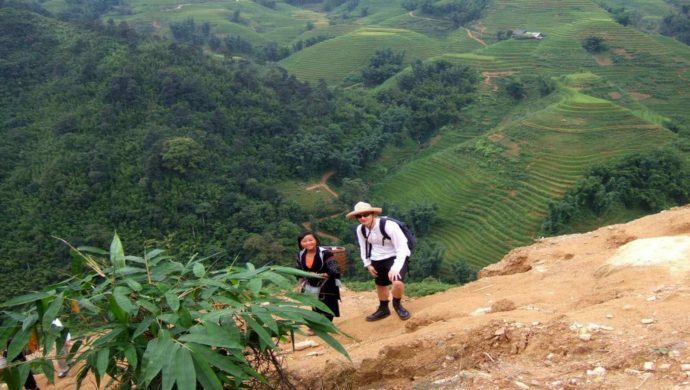 Sapa trekking 4nights 3days tour, visits the mountainous Sapa region, visiting the villages of the colorful ethnic tribes living here. 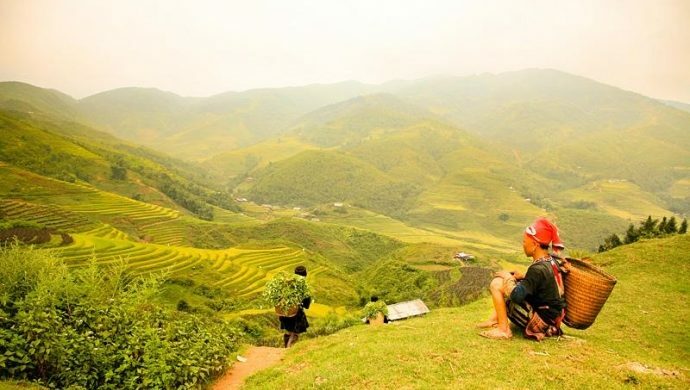 Visit the Lao Chai village of Hmong hill tribe, Dragon mountain, Tavan Village – Giang Ta Chai, the Silver waterfall, Tramtron Pass and the Fansipang valley. 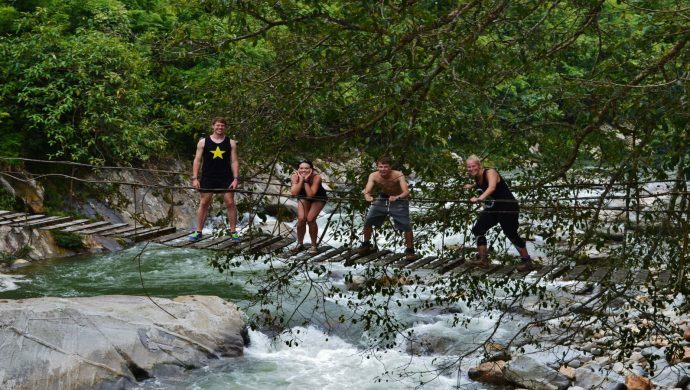 Lots of exciting treks and discoveries in Sapa. 7:30pm – 20:00pm – HTS tour guide will come and pick you up from your hotel in Hanoi’s Old Quarter then transfer you to Hanoi Railway station to catch the night train to Lao Cai (overnight on train, in 4 berth share cabin, soft sleeper and air-conditioning)., Arrive in Lao Cai at 5:00am. Arrive in Lao Cai station at 5:00 in the morning . You are welcomed by driver, then transfered to Sapa by bus. The bus ride uphill to Sa Pa takes a little over an hour, giving you a glimpse of the stunning vistas and impressive rice terraces. You will have breakfast at hotel before we start 12 km of trekking to visit Y Linh Ho and Lao Chai villages of the H’mong minority. 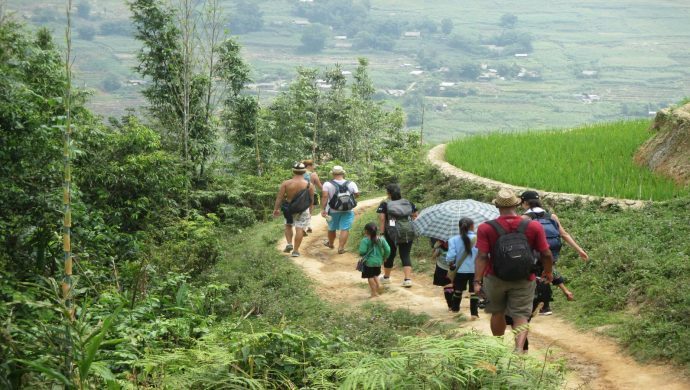 The trekking route offers some challenges as you balance on the rice terraces and a small trail on the steep mountainside. The vegetation is dense as the trail leads up to a peaceful village perched on the Hoang Lien mountainside. Head down hill and relax by a local stream for a picnic lunch. After lunch , we continue trekking to Ta Van village of the Dzay where we have dinner and enjoy a unique home stay experience. A farewell to the family after breakfast, we will experience our day of trekking that takes you along local paths, up and down rice terraces and into the villages and homes of the local hill tribes, the Dzays, the Dzaos, the Hmongs, the Tays. Enjoy a picnic lunch by the stream before moving on to Ban Ho village, an imagination of down tower steps with a universal view of the house roofs of the Tay minority isolated in a green valley appearing in front of your eyes will mark you an unforgettable trip. Dinner and stay overnight with Tay hill tribe family. In the early morning you will get a wakeup call by our guide and spend time to enjoy a pleasant breakfast. Say good bye to local people and start a new trek with more stunning landscapes and other ethnic minority villages dotted to your eyes sight. You enjoy 2 km to a very nice waterfall discovered and named “the Lavie” by the French during the colonial time in Vietnam. Enjoy swimming then picnic-lunch on the bank. In the afternoon trek 4 km up to the main road to get the jeep to return Sapa. You spend time for shower before getting on a bus to Lao Cai train station for the night train back to Hanoi. Arrive in Hanoi early morning, then transfer to your hotel by yourself and this is the finish your unforgettable Sapa Tour with HTS tour . Good bye & see next time!